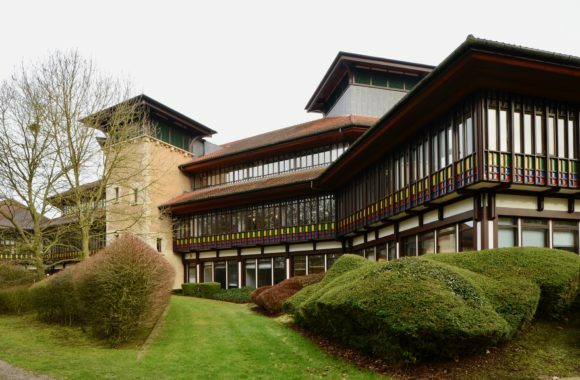 The former HQ of the Pearl Assurance company, a striking Post-Modernist building, standing in one of England’s pioneering business parks just outside Peterborough, has been listed at Grade II following an application from the C20 Society. 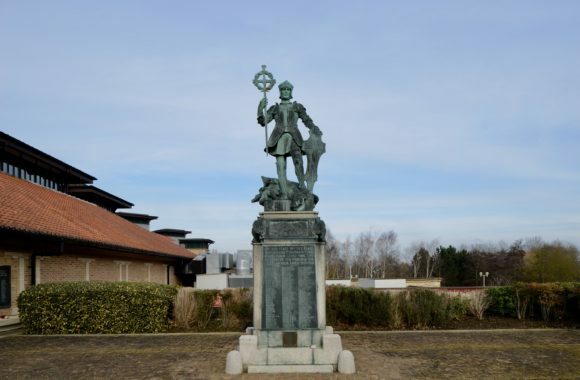 We also succeeded in gaining recognition for the 25 acres of landscaped grounds which have been added to the designation register and Grade II* listing for a war memorial, relocated from the company’s London offices, which commemorates the lives of the 659 employees who died during the two world wars. As is characteristic of Post-Modern works, the architects of the Pearl Centre, Chapman, Taylor Partners, drew inspiration from previous building traditions and styles, including Romanesque and Italianate architecture and English medieval timber-framed construction, the decorative elements echoing Moorish traditions and the work of Charles Rennie Mackintosh. Constructed between 1986 and 1992 to accommodate 2,200 staff, the building is vast in scale with three square blocks of open plan offices, each three storeys high, with an open –sided atrium, an attached computer hall, a 600-seater restaurant and training centre and two decks of underground parking. 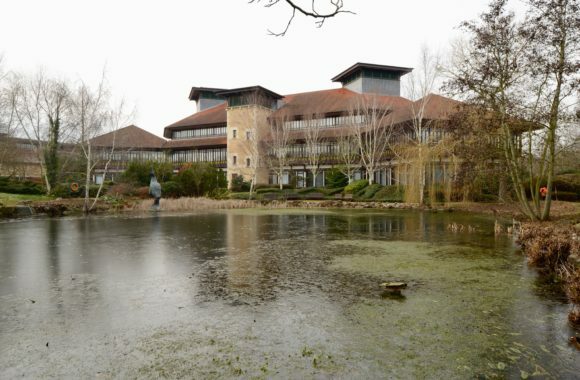 The complex is situated on Lynch Wood Business Park, a pioneering initiative from Peterborough Development Corporation which was created in 1968 after Peterborough was given New Town status and charged with the urban development of the area to provide homes, work and a full range of services required for the relocation of 70,000 people. Landscape architecture was an important aspect of these developments, not just to create a corporate identity, but also to provide attractive places for office workers to have their lunch – an important consideration in semi-rural locations where there was no High Street to escape to. The designed landscape of the Pearl Centre is considered an important work by Professor Arnold Weddle, an accomplished landscape designer and influential lecturer. Executed under the direction of Chapman Taylor Partners, it is a rare example of a designed landscape intimately connected to and complementing a contemporary office building. It features sculptural landforms creating a variety of external spaces, including: lakes, a memorial garden, entrance courtyard, physic garden, parterre garden, pyramid, wildflower meadow and ziggurat. These features were not just ornamental: the lake was stocked with coarse fish and used for fishing, and the platform of the pyramid was intended for use as a boules court or events space. More than 75,000 trees and shrubs of 500 varieties were planted. The war memorial, which sits in a dedicated courtyard memorial garden to the east of the Pearl Centre, is of high architectural and artistic quality. The memorial previously stood in the courtyard of the Pearl Assurance Company’s head offices in High Holborn. The free-standing monument and four bronze plaques act as an eloquent witness to the tragic impact of world events on the community of the Pearl Assurance Company, and the sacrifice it made in the conflicts of the two world wars. Designed by Sir George James Frampton RA, a notable sculptor and craftsman of architectural and public sculpture, the elegant and artistically detailed memorial is considered to be of outstanding artistic interest. Frampton is associated with a number of highly-graded public sculptures, including a series of statues of Queen Victoria for St Helen’s, Newcastle and Leeds (around 1903-6, each listed at Grade II*). At the time that we put forward the listing applications, there had been a proposal for a new building on the site of the current car park with plans to move the car park to the site of the landscaped maze, requiring an access road to cut through the landscape. The application was withdrawn following many objections, but the listing assessment went ahead. The decision will help protect this very special complex from any future unsympathetic developments. We have been leading a campaign to gain greater appreciation and protection for Post Modernist architecture for many years, hosting a conference back in 2016, which highlighted the threat to this style of architecture. 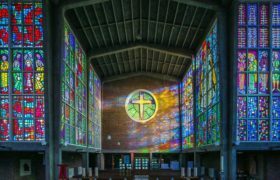 Our Director Catherine Croft recently attended a conference, “Preserving the recent Past 3” in Los Angeles, where she chaired a panel on Post Modernist architecture. 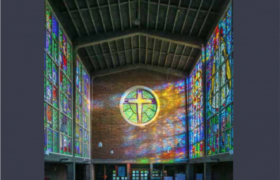 The UK was publicly acknowledged as being ‘ahead of the game’ in the preservation of this style of architecture and we were thanked for our role in this.